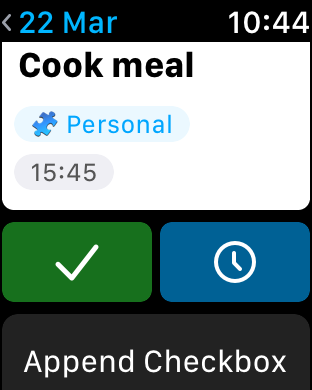 The Sorted³ Watch App is designed to provide the bare minimum features which allow you take a quick overview of your day and control what to do next. 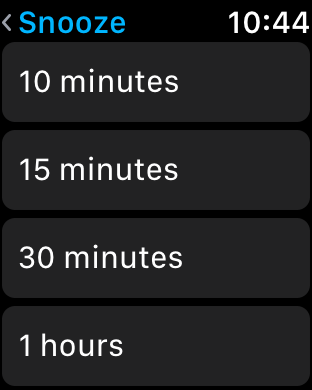 Showing the Today Schedule: when you open the Watch App you will see all the items in your schedule for today, anytime Tasks and Events first (dislayed in the same order as on your iPhone or iPad, then timed Tasks and Events. Adding New Task - tap the big Plus sign at the top of the display. Completing Tasks and Events – you can complete by tapping the checkbox next to the item in the Today Schedule screen, or by tapping on the item and then on the green tick box on the next screen. 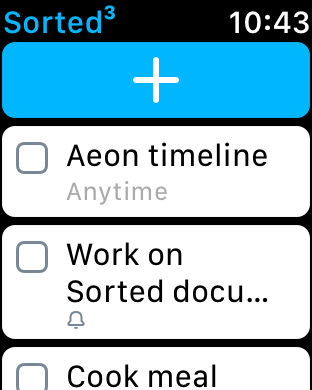 Snoozing/deferring a Task – tap on the Task and then on the blue button with a clock symbol. You will see options to snooze for 10 minutes, 15 minutes, 30 minutes, 1 hour or until tomorrow. Appending a Checkbox (list item) in the Task or Event description – tap on the item and then on the ‘Append Checkbox’ button, then dictate the text of your checkbox/list item clearly. Appending a Note in the Task or Event description – tap on the item and then on the ‘Append Note’ button, then dictate the text of your note clearly.